Something that’s bothered me in recent years about the Grammy Awards is its “one-time-only” variety of collaborations, which often finds contemporary artists awkwardly paired up with elder (and usually more talented) musicians. Last night’s ceremony supplied an ample amount of such curious scenarios—the Jonas Brothers and Stevie Wonder, Lil Wayne and Allen Toussaint—but one above all struck me as particularly disheartening. 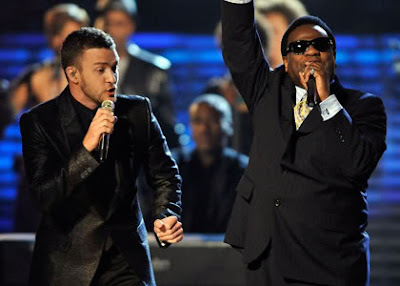 In perhaps the most mismatched pairing of the night, Justin Timberlake sang “Let’s Stay Together” with Al Green, ostensibly in light of their mutual Memphis roots. Despite his respective talents in the pop field in which he thrives, however, Timberlake looked (and sounded) embarrassingly out of his league as he struggled to vocally hold his own in the presence of the reverential soul man. Incidentally, why was Al Green relegated to doling out one of his classics when his latest album, Lay It Down—arguably his strongest effort in two decades and among the best overall of 2008—had garnered four nominations, ultimately winning two awards? Perhaps the point of these one-off collaborative performances is to ingratiate esteemed yet elder artists to a wider, younger demographic through the drawing power of more contemporary acts. What usually happens, though—and what did happen Sunday night with Timberlake and Green—is that experience trumps popularity to such a degree that the chasm between the two not only seems insurmountable, but laughable as well. Sorry dude, but Stevie Wonder and the Jo-Bros gets my vote.